Our line of high-quality residential Architectural mailboxes include curbside post mount mailboxes, wall mount mailboxes, and column-mounted mailboxes. The traditional American curbside post mount mailbox design, like the Architectural Mailboxes Coronado (pictured here), was introduced as far back as 1915 by a post office employee and features a tunnel-shaped curved top, a latching door, and a brightly colored mailbox flag. 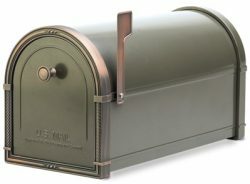 The curved mailbox top helped to deflect rain and snow and this original mailbox design was initially given away, free of charge, by the U.S. Post Office. This allowed mailbox manufacturers like Architectural Mailboxes to freely and easily duplicate this classic post mount mailbox design without worrying about patent infringements. While today’s USPS approved post mount mailboxes include a wide variety of styles and design variations that allow homeowners to express their individual taste, this original functional mailbox design has endured for nearly a century. Our line of residential Architectural mailboxes follows this tradition and is one of the most recognizable icons of our North American culture. Along with standard residential Architectural mailboxes and posts, this manufacturer also makes large locking curbside mailboxes that feature a hopper door to receive small and medium sized parcels. The Architectural Oasis mailbox is a prime example of this and ideal for home-based businesses that often receive large envelopes or numerous small packages. More suitable to upscale townhouses and condos in an urban setting are wall mount residential Architectural mailboxes like the embossed Peninsula mailbox shown here in antique brass. 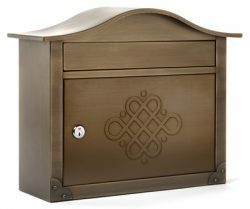 This Architectural wall mount mailbox features a curved top and embossed “Eternity” design on the front. Wall mount Architectural Mailboxes like the Peninsula are simple, shallow cabinets with locking doors that come with a 5-pin cam lock and keys. Architectural Mailboxes has established a great on-going reputation for product innovation, quality workmanship, aesthetic mailbox designs, and end-user security. A sister to the Oasis post mount residential Architectural mailbox mentioned above is the large column mounted Oasis mailbox. Architectural decorative mailboxes are generally designed to be durable and functional, yet they incorporate stylish accents to compliment any home. Many people are surprised to discover just how many style choices there are for residential Architectural mailboxes. One of our more popular Architectural mailbox products is the post mounted Coronado mailbox, which is available in over a dozen different finishes, including bronze, white, sand, or black; with a combination of polished brass, antique copper, antique nickel, or antique bronze accents. Other popular designs for residential Architectural mailboxes include the lovely Geneva style mailbox that reflects Baroque European style elements and comes with a handy locking rear access door so that you don’t have to step into the street to retrieve the mail. Need Help? Just Ask Us! Architectural Mailboxes are designed for rural, urban, and suburban applications and can also be customized with Architectural address numbers such as the hand finished antique brass Laguna house numbers. While most of our clients for residential Architectural mailboxes are individual homeowners, we also supply commercial Architectural mailbox products for business use. Talk to our mailbox professionals at The MailboxWorks if you need help selecting the style, model, or mounting options for your choice of residential Architectural mailboxes. Please contact us Toll-Free at 1-866-717-4943 or complete our online mailbox contact form.